Soups, stews and chowders have been a part of life throughout American history. Whether cooked over a campfire or simmering on the back of the old woodburning stove, our ancestors combined whatever ingredients were available, seasoning them to create hot meals which everyone in the family would appreciate. 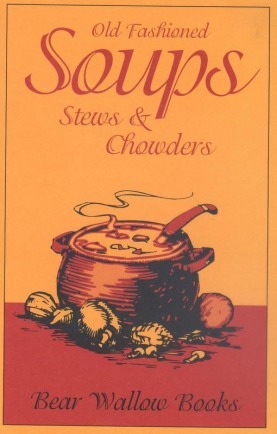 Included among the 58 recipes in this book are vegetable, beef, chicken and fish stocks, which simmer on the stove, to be used in many wonderful dishes. Of course, commercially prepared stock or broth can be used as well, to speed the preparation of Peanut Soup, Shaker Herb Soup and Country Vegetable Chowder. Try Baked Beef Stew on a cold winter day, Dutch Country Cheese Soup for a different taste, or cold Summer Cucumber Soup when the temperature climbs. All are delicious reminders of our American Heritage. Booklet, c1981, 32 p. : ill. ; 14 cm.